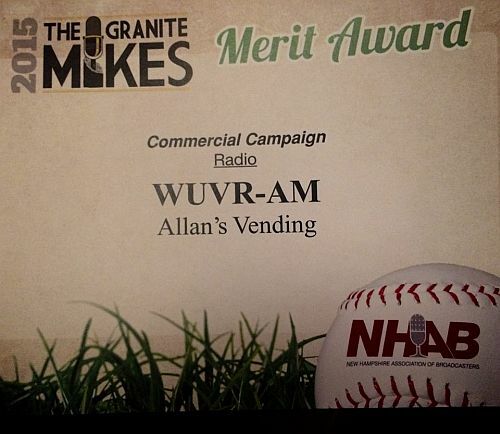 Congratulations to stations WUVR and WCNL for garnering awards at last night’s New Hampshire Broadcasters Association, (NHBA) Granite Mike Awards. WCNL took home Granite Mike awards for Public Service Announcement, and Public Service Campaign in addition WCNL’s General Manager Steve Smith also took merit awards for their Morning team and a commercial they produced. WUVR’s General Manager Matt Cross was honored with a merit award for a Radio- Commercial Campaign produced by WUVR. DJ Andy Blacksmith, of WHEB’s Greg and The Morning Buzz, who died from heart failure in July, received the Broadcaster of the Year Award. Blackburn’s mother and sister accepted the posthumous achievement. A 34-year-old Bellows Falls VT man is accused of stealing a piece of pie from Cumberland Farms in Bellows Falls. Police say after a brief investigation into a complaint of a customer stealing a piece of pie just after 1 pm on Wednesday they arrest Christopher Paige. Paige was cited to appear in the Vermont Superior Court, Windham Criminal Division to answer to the charge of Retail Theft. A head on collision in Chester VT just before 8 am on Thursday had Rte 103 closed for over two hours. Police say a passenger minivan and a Town of Chester dump truck were involved and both received heavy damage, but there were no major injuries. Fire Crews from Chester and Proctorsville worked to contain the over 50-gallon diesel fuel and assisted in the cleanup. This area will be checked over the course of the next few days to ensure environmental safety. The crash investigation is still ongoing at this time’ no names will be released. Rumors of this involving a fatality are incorrect and there has been no death reported in this crash. Benevolent Association assisted Kelly Petrin, the founder of the candy drive, in collecting candy. Halloween tradition of Trick or Treat. The Sunapee Police Department Thanks everyone for their generosity. Claremont will not enforce its curfew or loitering ordinances. Police Chief and lawyer Alex Scott explained at last night’s City Council meeting how the ordinances infringe the on first amendment. Scott cited NH case law involving Keene’s curfew ordinance in the 1980’s when the Keene lost two challenges. Franklin reviewed the Keene cases when they were challenged by the ACLU on reinstating its curfew ordinance. After the review, Franklin decided not to reinstate its curfew. The Chief gave an example of how lawful conduct becomes illegal under a curfew. Chief Scott said he talk for hours on the first amendment and would like to give a longer presentation at a later day.